Thinking about getting your child an iPad or iPod touch and wondering how to safely give them limited email access on iOS? Email is a handy way to share things like pictures they've taken with the Camera app. I've chosen to use Hotmail (Windows Live) for my kids because of the level of parental control they provide. Here's how I've set things up. Use a random assortment of letters and numbers to create a username only you (the parent) can relate back to your child. Create a strong password that only you (the parent) knows. Use your (the parents) email address as the alternate. Leave everything else as non-identifiable as possible. Turn all privacy options to the maximum (most stringent) possible. Select Exclusive, so everything is sent to Junk except for safe senders. Click Save. 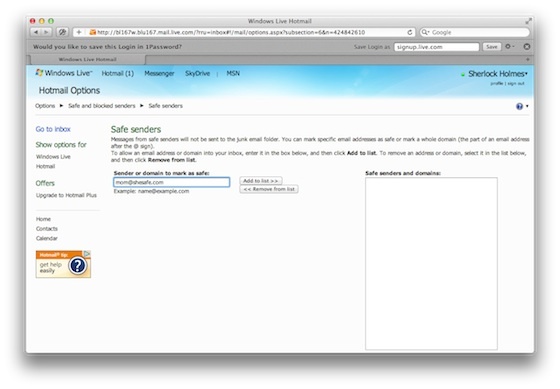 Go to Safe and Blocked senders, click on Safe Senders. Add only the people you absolutely trust to the Safe Senders list (mom, dad, perhaps siblings or grandparents), click Add to List for each one. Once this is setup, you can add the email account to your child's iPod touch or iPad. I also recommend adding it to your own iPhone or iOS device so you can monitor what's being sent and received and adjust (or shut down) accordingly. You can also go to Settings, General, Restrictions on your child's iOS device and toggle Allow Changes: Accounts: to "Don't Allow Changes" to prevent anything from being altered. It's not perfect, and if your children are really young you may want to forgo email entirely. But if you want to slowly get them used to using email, and you want to do it as saf this is the best setup I've found to date. If anyone else has any better or alternate ideas, please share them in the comments!